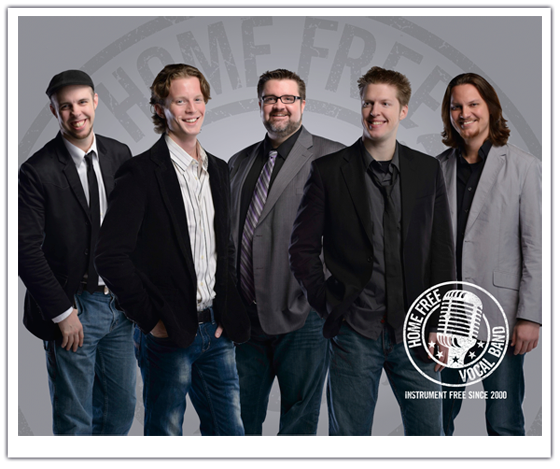 Home Free vocal group members Chris Rupp ’02, Austin Brown, Rob Lundquist, Adam Rupp ’04, and Tim Foust. The Minnesota-based vocal band Home Free advanced to the finals of NBC’s The Sing-Off by returning to its country roots Thursday night with the Zach Brown Band’s “Colder Weather”. The ensemble’s emotional arrangement incorporated tightly-knit harmonies in the upper range with astounding solos by Rob Lundquist and Austin Brown and had the distinctly different country sound that sets the band apart from its competition. The two-hour finale will be aired on NBC stations on Monday, December 23 at 7:00 p.m. Get the popcorn ready. This will be worth every minute and may well be the best concert of Christmas season. Earlier in the week, Home Free advanced with a jaw-dropping rendition of the great Johnny Cash’s “Ring of Fire” (was that really a double-low F#?) and a heart-throbbing performance of Roy Orbison’s “Pretty Woman.” The Minnesota-based a cappella ensemble, with baritone Chris Rupp ’02 and vocal percussionist Adam Rupp ’04, has won its way into the musical hearts of America. As Home Free enter the finals on Monday night, only three of the original ten groups remain. Chris Rupp, the group’s musical director and baritone, studied for three years at Gustavus before earning his degree from Minnesota State, Mankato in music performance with an emphasis in vocal and piano. Chris’ younger brother Adam Rupp, the group’s vocal percussionist, graduated from Gustavus in 2004 with a music performance degree in trumpet. The Sing-Off showcases the country’s top a cappella groups, which are competing for a recording contract and a cash prize of $100,000. The program is hosted by Nick Lachey, while Jewel, Ben Folds from Ben Folds Five, and Shawn Stockman from Boyz II Men serve as judges. Ten groups started the competition when this season premiered on Monday, Dec. 9. The group is currently in the middle of its Holiday Tour and will be performing in Mankato next week. The group performed at the Fitzgerald Theater in St. Paul on Saturday, Dec. 14. Due to an early sell-out of the group’s Hosanna Lutheran Church, Mankato, performance on Sunday, Dec. 22, a matinee has been added. Tickets and more information about the group are available on its website at homefreevocalband.com. Any chance we can get them to perform here since they have two Gustie grads?